WASHINGTON, DC, April 22, 2014 (ENS) – Thousands of Earth Day actions today brought people together to plant trees and preserve forests, create cleaner, greener cities and safeguard wildlife. 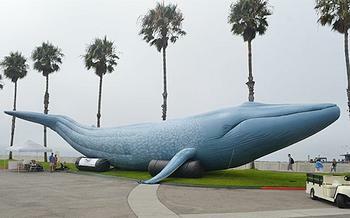 A life-sized 90-foot-long inflatable blue whale named Mz. Blue made its appearance in front of the White House today to dramatize ocean advocates’ Earth Day request that President Barack Obama help blue whales off the coast of California. The officially sanctioned commercial shipping transit lane along the Southern California coast cuts through critical blue whale feeding habitat. Ship strikes, collisions between the whales and the ships, result in many whale deaths. The Great Whale Conservancy, owner of the inflatable whale, will submit a letter to The White House asking President Obama to direct the U.S. Navy to remove its objection to the use of an alternate shipping lane in California waters to reduce the killing of blue whales from ship strikes. The letter is signed by NGOs from around the world working to protect whales, and carries more than 120,000 signatures gathered from an on-line petition. Speakers at the event include oceanographer and explorer Dr. Sylvia Earle, founder, Mission Blue/Sylvia Earle Alliance and Ocean Doctor Board Member, along with Dr. David E. Guggenheim, president of Ocean Doctor and board member of the Great Whale Conservancy. Today, the Cowboy Indian Alliance, a group of ranchers, farmers and tribal communities from along the Keystone XL tar sands pipeline route, rode into Washington, DC and set up camp on the National Mall near the White House to tell President Obama to reject the pipeline. On April 26, thousands of people will join them to stand together to communicate their message that the Keystone XL pipeline and the tar sands must be rejected to protect this, and future generations. These demonstrations are just two of thousands of events in which over one billion people in 192 countries will participate, according to the Earth Day Network. Green Cities is the Earth Day Network theme this year and through Earth Day 2015. Earth Day Network launched the Green Cities campaign in the fall of 2013 to help cities everywhere become more sustainable and reduce their carbon footprint through three key elements – buildings, energy, and transportation. Earth Day spokesman Alex Standen blogs about one initiative intended to move the Green Cities campaign forward – Uber, a company that connects riders to drivers in more than 70 cities through its apps. Other Earth Day Network events around the world include B the Hope for Haiti, a group teaching primary school students about recycling, composting, the importance of proper waste management and tree planting. The University of Fiji will host its first Earth Day event, a clean-up to improve waste management on campus and help students learn about environmental responsibility. In Riga, Latvia, Homo Ecos is hosting an Urban Gardening Workshop for Earth Day with eco-friendly composting, making planters out of recyclables, and caring for an urban garden. Earth Day Network Philippines is staging its first Pro-Earth Run 2014, an advocacy campaign to encourage people in the sensible and sustainable care of Mother Earth. In Uganda, the 4-H Million Trees Project is creating tree nursery projects at schools and helping students begin planting 50,000 trees. Students at GUtech in Oman are hosting their annual Earth Day Event at Al Sahwa Park, promoting “green life” by selling fresh local produce and encouraging people to plant trees. 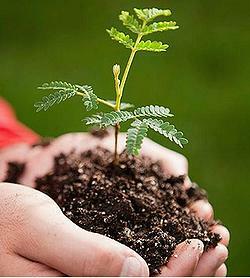 Many Earth Day events throughout the world are focused on trees and forests. In Western Canada, conservationists are calling on the British Columbia government to expand protection around MacMillan Provincial Park to fully encompass the forests above and adjacent to the world-famous Cathedral Grove. 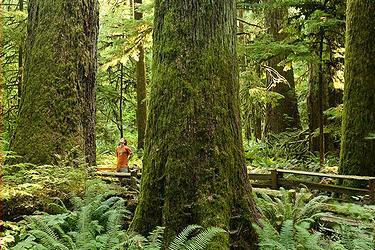 Cathedral Grove is Canada’s most popular old-growth forest on Vancouver Island, visited by millions of tourists each year, but the company Island Timberlands has built a road through old-growth forests on Mt. Horne, the mountainside above Cathedral Grove, and could potentially begin logging of a new cutblock that could come as close as 300 meters from the park boundary. In New York City, the Wildlife Conservation Society’s 96 Elephants campaign today released exactly 96 seconds of video footage of playful baby elephants to celebrate Earth Day – and to draw attention to the fact that 96 elephants are killed every day in Africa by poachers. The footage includes five orphaned elephants mugging for the camera in the David Sheldrick Wildlife Trust Elephant & Rhino Orphanage in Nairobi. These elephant’s parents were shot by ivory poachers. Other footage shows wild elephants at the Mpala Research Centre in Kenya. Today, 84 companies worldwide were recognized for creating the most positive environmental impact by the nonprofit B Lab with the release of the third annual “B Corp Best for the Environment” list. The “B Corp Best for the Environment” list honors micro, small and mid-sized businesses that earned an environmental impact score in the top 10 percent of all Certified B Corporations on the B Impact Assessment, a look at a company’s impact on its workers, community and the environment. Honored companies range across many industry sectors. They include outdoor retailers Patagonia and GoLite; home and personal care companies Method and Seventh Generation; the employee-owned, craft brewery New Belgium Brewery; the 20-year-old waste reduction and management company WasteZero; West Paw Design, a U.S. manufacturer of eco-friendly products for dogs and cats; and Hawaiian Legacy Hardwoods, which plants rare high-value endemic koa trees on Hawaii Island. On Earth Day and every day, U.S. Peace Corps volunteers lead grassroots efforts to protect and preserve the environment in the countries where they serve. Volunteers promote reforestation, build fuel-efficient cook stoves, enhance food security and institute environmental education programs. In Cameroon, for instance, Peace Corps volunteer Rachel Warner of Waukesha, Wisconsin, is planting 2,000 trees at a local school to revitalize the land and provide shade for the students, who are often exposed to the sun and heat. Funds for Warner’s project are being raised through the Peace Corps Partnership Program. A local tree nursery will donate 1,000 trees, and community members will help plant the trees and lead a free training session on tree planting.